Wargaming.net, the firm financing the dig, has also said there are no planes. But project leader David Cundall says they are looking in the wrong place. He told the BBC that he feels very frustrated but is determined to keep up his campaign, and remains convinced Spitfires are buried in Burma. The team of archaeologists working on the dig are specialists in the field of war excavations. They have been digging at the site over the last week. They have also examined the file of evidence supplied by David Cundall which includes eyewitness testimony from eight individuals. However they believe that none of the testimony proves that Spitfires were buried at the airport or any of the other sites in Burma. The team has also examined the existing war archives as well as photographs and drawings by official war artists from the period. I understand they believe traces of metal alloy found in the ground could come from other sources. During the dig they uncovered pieces of the old metal runway. One possibility they have studied is that witnesses may have seen crates of other aircraft - used for observation work - being shipped through the airport during the period. However, Mr Cundall insists that his eyewitness testimony is correct. He says the archaeologists have dug in the wrong place. The dig was delayed on Thursday by official concerns that work could interfere with electric cables and water pipes. Asked if he would apologise if he was proved wrong, he replied: "Of course I will. But I've tried and I believe it's better to have tried and failed than not to have tried at all." An initial survey of the site began in early January, with excavations due to begin after that. A scheduled press conference was cancelled on Friday morning by Wargaming Ltd, with a spokesman saying he hoped to give more details later. When pressed, the spokesman said there are no Spitfires, our correspondent says. British campaigner David Cundall has spent the last 17 years trying to discover the truth of claims that unused, unassembled Spitfires were packed into crates and buried by the RAF at sites in Burma on the orders of Lord Mountbatten at the end of the war in 1945. He has collected eyewitness accounts from American and British service personnel as well as local people. One of them, British veteran Stanley Coombe, had travelled to Burma to witness the excavation. The dig got the go ahead after it secured funding from Belarusian video games firm Wargaming.net, and received permission from Burmese President Thein Sein during a meeting with British Prime Minister David Cameron last year. 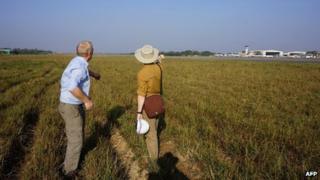 Mr Cundall maintains that as many as 124 Spitfires are buried in sites around Burma. Before the dig, scientists had discovered large concentrations of metal under the ground around Rangoon's airport, lending support to the theory that up to 36 planes are buried there. Earlier this month, a crate was discovered in the Kachin state capital Myitkyina, but muddy water stopped an immediate identification of its contents. The central city of Meiktila was another site identified as a possible burial ground for the Spitfires.